The beleaguered press secretary resigns after Trump settles on Scaramucci for communications director, splitting aides. It's a dramatic end for Spicer's White House tenure, which has been marked by combative exchanges with reporters in the briefing room and a rocky relationship with the president, who never warmed to the former Republican National Committee communications official. It also marks a potential new direction for the White House communications shop, which has struggled to keep up with the flood of developments regarding the Russia investigations while trying to push Trump’s ambitious — yet stalled — legislative agenda. Spicer’s departure is the latest for an administration that already has seen its communications director, national security adviser, deputy chief of staff and vice president’s chief of staff leave or announce their imminent departures. Trump thanked Spicer for his service in a statement delivered by deputy press secretary Sarah Sanders during a rare on-camera press briefing on Friday, and delivered a true-to-form compliment. "I am grateful for Sean's work on behalf of my administration and the American people. I wish him continued success as he moves on to pursue new opportunities. Just look at his great television ratings," Trump said of Spicer. Sanders will take over as press secretary, and Spicer will stay on until August. When Spicer found out about Trump's interest in bringing Scaramucci on board on Thursday night, he vented to confidants that he did not think Scaramucci could handle a major media campaign and didn't deserve the job, one of the confidants said. He also expressed concern about whether Scaramucci would technically be in a senior position to him, since in the Obama administration the communications director was senior to the press secretary, according to two people familiar with the conversations. "He's never done communications in his life," said another person who spoke to Spicer about his thoughts on Scaramucci. Trump offered Spicer a role to stay in the White House, but it was vague and Spicer declined, according to a senior administration official and Spicer confidant. "It's been an honor & a privilege to serve @POTUS @realDonaldTrump & this amazing country. 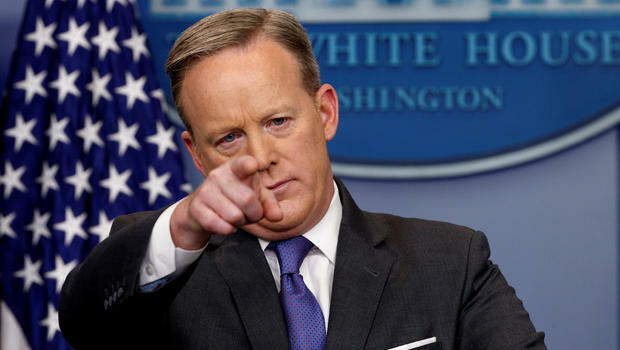 I will continue my service through August," Spicer tweeted on Friday afternoon. Spicer told The Associated Press that he resigned to clear the way for Scaramucci, saying, "We're at the point where" the president "could benefit from a clean slate." He said Scaramucci’s tenure will “be great,” adding, “He's a tough guy." Scaramucci also appeared at the White House briefing on Friday, and downplayed tensions around his appointment, saying he had a strong relationship with chief of staff Reince Priebus, who also voiced opposition to Scaramucci's appointment, according to multiple sources. "There's been some speculation in the press about me and Reince, so I just want to talk about that very quickly," he said. "Reince and I have been personal friends for six years. We are a little bit like brothers where we rough each other up once in a while, which is totally normal for brothers," he said. "I don’t have any friction with Sean, I don’t have any friction with Reince," Scaramucci said, though he also said, "We can all live" with a "little bit of friction" in the White House. Despite the public professions of optimism, Scaramucci's expected appointment has caused great upheaval in the West Wing, with Priebus and chief strategist Steve Bannon also expressing opposition to him getting the high-profile job. "This was a murdering of Reince and Bannon. They said Anthony would get this job over their dead bodies," said one top White House official. Another White House official disputed that Priebus used these words and said the chief of staff has a long-standing and good relationship with Scaramucci. The official said Priebus did not want to stop Scaramucci's appointment but instead just wanted to slow the process down. The first official added that Scaramucci had the backing of Trump son-in-law and top adviser Jared Kushner, Ivanka Trump, National Economic Council Director Gary Cohn, and Deputy National Security Adviser Dina Powell. A third White House official said Spicer was gracious while breaking the news of his departure, offered some praise for Scaramucci, while saying he would help with a transition. In the press office there was a round of applause on Friday morning for Spicer and then for Scaramucci, led by Priebus, according to a White House official. But a source close to the White House press operation said there are serious doubts among some aides that Scaramucci will be able to handle the full scope of the job. “The challenge really here is that Scaramucci was being given a ceremonial title as communications director with absolutely no understanding of what that position means and with no understanding of how government works. So it’s really more of a joke that he’s being offered this position." The White House will try to project a unified front, with Spicer, Priebus and Scaramucci all due to appear on Fox News host Sean Hannity's show on Friday night. Scaramucci, who has been an avid defender of Trump on TV in recent months, will replace Mike Dubke, who resigned from the job in May. He is joining the White House after being blocked from other senior jobs, including director of the office of public liaison, which is in charge of managing the administration's relationship with big business groups, amid concerns about his extensive business entanglements and lack of political experience. But Scaramuci does bring with him a natural ease with Trump, and he is seen as a natural schmoozer and fixture on the global financial scene from Davos to his own lavish hedge fund conference in Las Vegas, Scaramucci drew resistance from others in the White House, including Priebus, White House officials said. One source with knowledge of the conversations between Trump and Scaramucci said the latter’s new post could be read as a message to Priebus, a former RNC chairman who has not built a strong relationship with Trump. "Just hiring Anthony is telling Reince beat it, go find another job," said the source, who cited the tense relationship between the two. Priebus' role in previously blocking him from joining the administration has been a sore point between the two. Another White House official said Scaramucci will be a big asset as Trump tries to deliver on his aggressive legislative agenda, including tax reform and an infrastructure package. "We are all super happy, well most of us are. He's got credibility including with some Democrats on the Hill. And he believes the press has a job to do. Good to have in this job as we move on to tax reform." Trump met with Scaramucci on Thursday night to discuss the role and again on Friday morning, according to three White House officials and two advisers with knowledge. Trump sees Scaramucci as a strong defender of him on television, particularly on the Russia scandal, and wants him to be focused on the surrogate strategy as communications director. As West Wing aides learned of Scaramucci’s likely appointment, Spicer suggested that he instead take the position of communications director for the National Economic Council, according to a Spicer confidant. Priebus, meanwhile, tried to offer Scaramucci the job he was originally promised -- director of the office of public liaison -- even though it's currently being filled by Priebus ally George Sifakis. Last month, Spicer was trying to set the stage for his potential departure, hinting that it was by choice that he was moving away from the podium, but that if he wasn't given control of the communications department, he would threaten to leave. But in recent weeks, he was feeling more confident in his new slot. For the past six weeks, he has been running point in meetings with communications and legislative affairs staffers overseeing the rollout of the administration's tax reform plans, moving into the more policy-oriented role that he said he wanted. And he has expressed skepticism that a shake-up in the communications department was imminent. "He's been in a good mood. He’s been enjoying lowering his profile and communications planning around tax reform and other issues in the White House,” said the source close to the press operation. Two sources with direct knowledge of the situation said that Scaramucci is being primed to eventually take on the position of chief of staff. One person close to White House said there is potential for mass exodus in press office. Priebus has told people he is determined to stay with the job for one year, mainly to prove the naysayers wrong, but it looks increasingly difficult. That person said that Priebus has been concerned about his reputation and thinks leaving any time short of a year would be seen as a failure. "The open question is Reince," the person said.